Observation - Stenocorus meridianus - UK and Ireland. Description: A Longhorn Beetle species. The larvae developed in damaged and diseased wood. The adults can be found visiting flowers in May and June. It can fly with surprising accuracy - this one was hovering through grass stems before it landed. 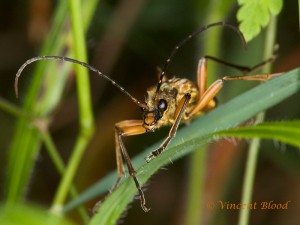 A Longhorn Beetle species. The larvae developed in damaged and diseased wood. The adults can be found visiting flowers in May and June. It can fly with surprising accuracy - this one was hovering through grass stems before it landed.